Friday afternoon: I left school as quickly as possible, met up with my eldest daughter and daughter-in-law, and together we caught the 5 pm ferry to Vancouver. My younger daughter met us on the other side for a girls' weekend. We stayed at Ashley's home in the Mount Pleasant area of the city, where trees planted long ago now arch over the narrow streets. It was a weekend of good food, laughter, and fun to celebrate my birthday. Ashley prepared a Turkish inspired breakfast on Saturday morning of poached eggs in ramekins with cream, herbs, and harissa oil, along with fresh bread, cucumbers and tomatoes. She used her beautiful Lomonosov china and I'm sure that made the tea taste better. It was delicious to the eyes and taste buds. For several hours, we played with Shibori techniques of fabric dyeing. Ashley got her vat of indigo dye working and we tied, scrunched, stitched, and dipped. I'll do another post later on the fun we had and show the beautiful results. We later wandered through stores we don't have here on the Island - Pottery Barn, Anthropologie, West Elm, Williams Sonoma, and more. We looked, were inspired, and purchased little. On the way back to the car I spied a clothing store and the girls helped me choose a couple of things for myself. On Saturday evening we went to Grub, an unassuming name for a small restaurant that served a most wonderful dinner. I had a roasted vegetable salad, then the most tender gnocchi ever, followed by roast duck, and a Mexican chocolate pie that hinted at cinnamon, served with a pear compote. As we rolled out of the restaurant, we noticed a used bookstore still open and wandered in for a pleasant half hour or so of browsing through stacks of books. We each purchased a few. This morning we went to Slickity Jim's for brunch. The menu had such inventive names - my poached eggs with caramelized onions, gorgonzola sauce and spinach on English muffins was called "The Breakfast of Broken Dreams" - others were "Tip toe through the Tulips," "To Mock a Killing Bird," and so on. After a rain-filled day on Saturday, Sunday was gloriously sunny and the mountains visible as we drove down Main Street. Thank you for your kind birthday wishes from my last post. We caught the ferry home this afternoon and Tim and I spent a quiet evening at home. I feel well celebrated! Sounds like an amazing weekend getaway! Isn't it fun to explore shops that aren't in your own community? Glad you had a great time and arrived home safely. What a wonderful way to celebrate your birthday, your girls weekend sounds fantastic. The fabric dyeing has me intrigued, I look forward to hearing more about it soon. Belated Happy Birthday -- and what a perfect way to spend it! You were in my new neighbourhood, as I think you might know, and I hope one day we'll be able to have coffee or tea or a glass of wine together there when you're over for a weekend. For now, I'm making note of those two restaurants and will have to check them out when we're back. Meanwhile, can't wait to find out about the Shibori experimenting. I've been a negligent blogger, and have now read through about three weeks of your posts! Loved every one of them too. 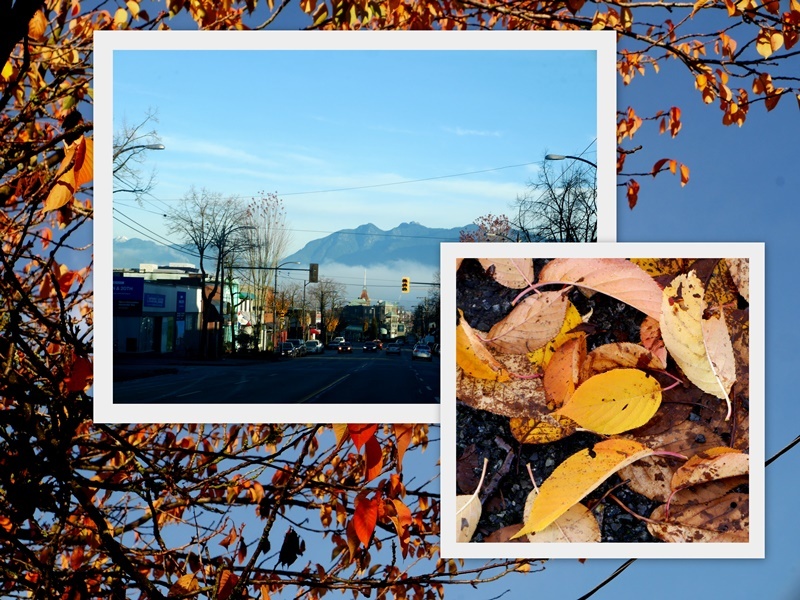 You've captured some beautiful photos of the changing season in the Victoria area. Love the shots in Sidney along the water. I'll be back to copy some of those apple recipes you shared too ;) Happy (belated) Birthday!! I'm creeping up to the big 60 myself, and I love how you wrote about ageing. Sometimes I feel like the same person I was at 30, but you just can't remain unchanged with all the life lessons learned. Sounds like a wonderful time spent with your daughters, and a special way to celebrate your birthday. Looking forward to seeing what you and your gals created! Enjoy your week ahead! What a wonderful celebratory birthday weekend with your daughters and daughter-in -law. Definately memories to be remembered with great company, delicious meals, browsing in stores and even something to craft. Happy Birthday! What a wonderful way to celebrate with your girls... Fun for all. Happy Monday! Sounds like a most wonderful way to enjoy your birthday. Love those beautiful tea cups. :) I like the sound of those restaurants you enjoyed and the items you shared from their menus. Delicious. Hope you have a great week! And that sounds like a most wonderful birthday weekend! Great memories. Sounds like an amazing weekend getaway, such a great way to celebrate your birthday with lots of love. Belated Happy Birthday Lorrie...your weekend sounds like fun! Those cups are beautiful...and I agree that tea tasted much better when served in a porcelain or bone china cup. What a lovely, lovely birthday weekend! I'm sure you feel well celebrated. A lovely girl time for your family. I look forward to hearing more about the blue! How totally wonderful to have girl time with your daughters. It sounds just perfect. So happy you were well celebrated. Best wishes for the coming year. What a memorable way to celebrate a milestone birthday. I'm also loving your daughter's beautiful Lomonosov china. Such a nice girls getaway birthday celebration Lorrie. Another year older and better! Tea definitely tastes better in a pretty china teacup. So glad you had a good celebration. Sounds like a lovely day. Love those lovely trees overhanging the road. Doesn't the right china always make the tea better? What a labor of love. :) And the fabric dyeing sounds like such fun... can't wait to see the results of that. What a wonderful weekend it was!! So pleased for you that it was so good! It sounds like there were all of the elements of a perfect birthday weekend! Your girls treated you fine! Every single moment of that weekend sounds perfect! It sounds like a wonderful weekend Lorrie. Yes, I agree it is difficult to think of oneself in an older body when you don't feel that way. How rare to be able to have brunch and tea with the china that is striking.Your girls gave you a memorable gift. Lorrie, A girls weekend is always a great time. Love the dyeing and will look for the next post on that. Looks like the food, company and shopping was a good time. Happy Birthday. Sylvia D.
I'm just catching up on blogging, Lorrie. I would say your girls spoiled you indeed! It all sounds so wonderful. I look forward to your fabric dying post. Happy Belated Birthday, Lorrie! All the very best in health, happiness and love. What a wonderfully relaxing and entertaining time you had with your daughters and daughter-in-law, who all made sure that it was very special. From the scrumptious food to the stunning, autumnal scenery, it sounds absolutely perfect! Now that sounds like a most lovely birthday weekend. One that will go down in the memory books, for sure. I'm interested to see what you gals created with the pretty blue fabric dyes. Belated birthday greetings to you, Lorrie. I love that indigo color. What else will you dye? Yarn perhaps? Working with textiles is most satisfying, isn't it. You had a wonderful birthday celebration, now enjoy the year with good health, joy, and peace. Your mosaic shows your pretty autumn colors; I like the blue sky background, gorgeous. What a perfect weekend with your girls! I love that they honored you like this for your birthday. Oh, and it makes me remember a night in Vacouver with mine this past summer. Such a great memory! Sorry I'm so late to read this post. House guest all last week and no time for blog visits. Your girl's weekend sounds great. Would love to visit your area again soon.